Serving residents of Columbia and Richmond Counties including, Augusta, Appling, Harlem, Martinez, Evans, and Grovetown. Click Here to read about Greenbrier Veterinary Services in the Augusta Chronicle on July 22, 2013. 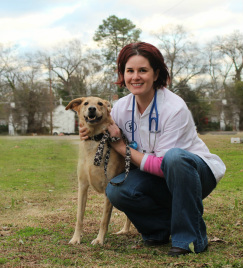 Greenbrier Veterinary Services strives to provide gentle, compassionate, and professional in-home veterinary care for residents of Evans, Grovetown, Martinez, Augusta, and the rest of the CSRA. From wellness exams and vaccinations for dogs and cats to companion therapy laser treatments and more, Dr. Wheatley can accommodate all of your pet health needs in the comfort of your own home. Whether you have a multi-pet household, pets who are stressed while traveling in the car, or geriatric pets with special needs, an in-home veterinary house call can provide a convenient and affordable solution with less stress to your pet. Most preventive care and many illnesses or abnormalities can be diagnosed and treated within the comfort of your home. Dr. Wheatley's goal in providing in-home veterinary care is to allow your pet to be more relaxed and open during exams, which makes diagnosis and treatment easier. Many animals are more likely to hide symptoms of illness when they are nervous or upset. Many find car rides or veterinary clinics to be a trigger of stress, anxiety, or aggression. Eliminating the travel to a perceived hostile environment of a clinic can allow for a more relaxed, more comprehensive visit. As an added bonus, veterinary house calls can save owners travel time and expense. Appointments are also available through our online scheduling service.